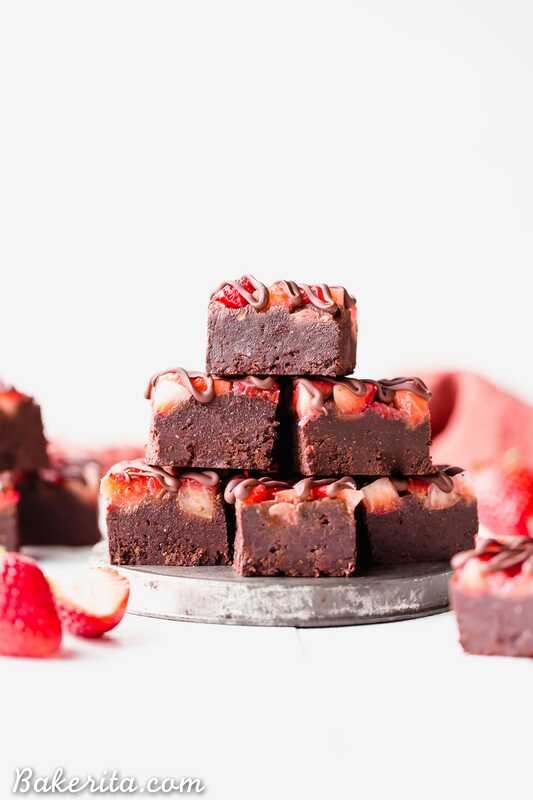 This Chocolate Strawberry Fudge is a simple and delicious five-ingredient recipe you’ll want to make over and over! It tastes just like chocolate covered strawberries, but way easier to make. There’s no cooking required for this gluten-free, paleo and vegan fudge recipe. Sneaking in another Valentine’s Day ready recipe for you guys, right before the big day! Luckily, this recipe is SO easy you don’t need to spend more than a couple minutes making it. So, if you’re behind and haven’t made your sweetie any treats yet, this one is for you. 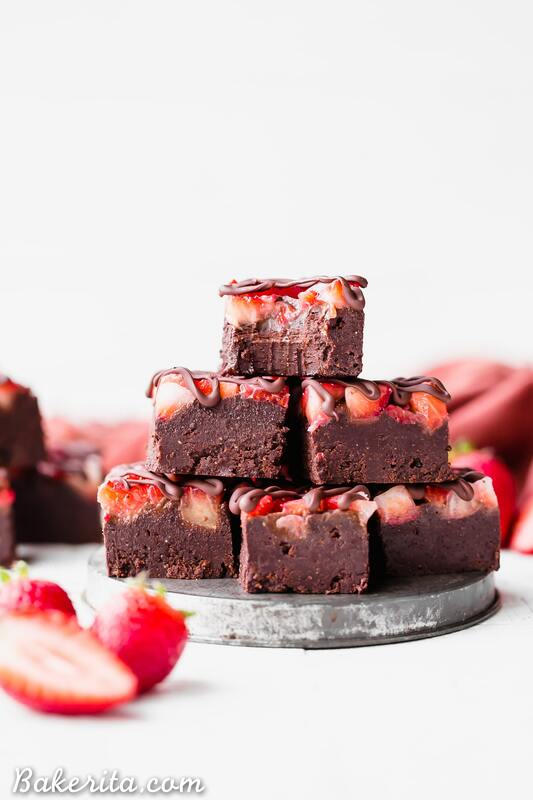 OR, if you’re like me, and spending this Valentine’s Day as a singleton, you can show yourself a little bit of self-love and make yourself a batch of this super simple chocolate strawberry fudge. It’s an awfully delicious way to be nice to yourself! I’m going to keep things short and sweet here today, just like the recipe, so let’s get right into what goodness goes into this EASIEST fudge ever. 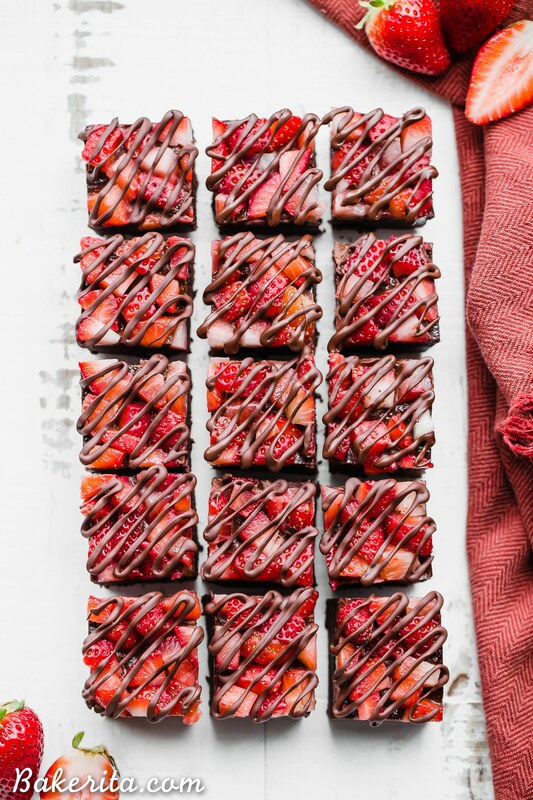 It’s similar to my all-time favorite paleo & vegan Chocolate Fudge, but adorned with fresh strawberries! Hopefully, you’ve already got most of the ingredients on hand. Let’s make the easiest ever Chocolate Strawberry Fudge! The first ingredient is coconut oil. It’s important because when coconut oil is cool, it firms up. This fudge is the same – it gets its structure from coconut oil, so it’s important to keep the fudge at a cool temperature, otherwise it’ll get soft and melty. Also, if you’re not a fan of coconut flavor (or just don’t want it present in your fudge), you can always use refined coconut oil, which has had the coconut flavor removed so it tastes totally neutral. To get the chocolate flavor, we turn to cacao powder. Cacao powder is a raw version of cocoa powder (which has been roasted) and it’s loaded with antioxidants. You can always use cocoa powder if it’s what you have, but I love using cacao because I’ll always take some extra nutritional benefits where I can get them! If your cacao powder is super clumpy, give a good whisk or sift before using to avoid clumps in your fudge. 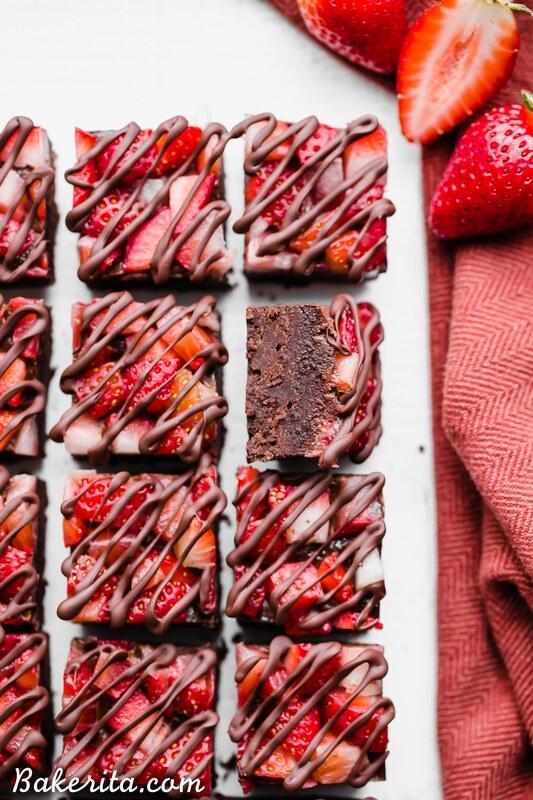 Next up for this chocolate strawberry fudge, we’ve got almond butter! The one I used is creamy and unsalted, which is what I always use for baking. Make sure you’ve stirred in allll those oils that tend to separate before using! You can also use another nut butter – creamy cashew butter would be amazing here too. Finally, to sweeten, we’ve got maple syrup. If you prefer, you can use honey (not vegan though) or agave in equal amounts. I do prefer the maple flavor here though – it’s not too strong, the way honey and agave can be sometimes. Optionally, you can add some salt and vanilla to the fudge as well, for a little extra flavor. To top it all off, we’ve got the star of the show: fresh strawberries! I was lucky to find some beautiful organic ones at the farmer’s market here in San Diego, but I know that’s a rarity in February. Just find the freshest, sweetest ones you can – and if you can’t find any good ones, you can always use raspberries or another berry instead. I topped it all off with an optional chocolate drizzle, mostly for looks . Though it did add a nice little chocolate crunch on top! You can do the drizzle, or skip it. Your call. 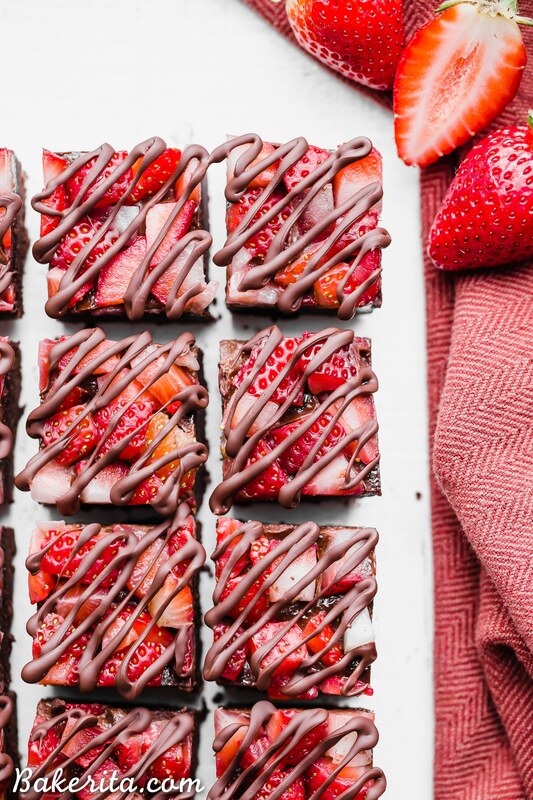 Either way, you’ll be left with a pan full of deceptively simple, irresistibly delicious Chocolate Strawberry Fudge! 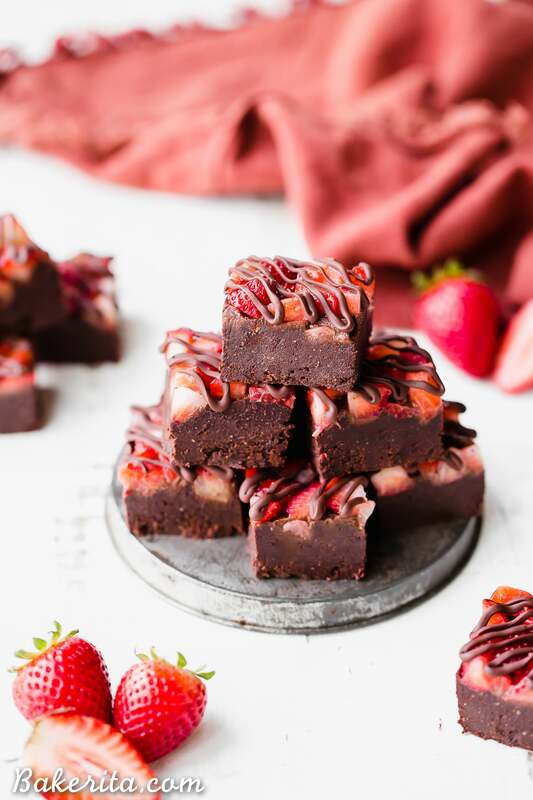 This Chocolate Strawberry Fudge is a simple and delicious five-ingredient recipe you'll want to make over and over! There's no cooking required for this gluten-free, paleo and vegan fudge recipe. Line a small baking pan with foil or parchment paper - I used a 9x5” loaf pan for a thick fudge. You can use an 8” square pan if you want thinner pieces. Melt coconut oil in a saucepan over medium-low heat or in the microwave for about 30 seconds to a minute. Whisk in the nut butter, maple syrup, cacao powder and if using, vanilla extract and salt, into the melted coconut oil until completely smooth. Pour mixture into the prepared pan and smooth it out to an even layer. Pour the strawberries evenly on top, pressing them in slightly. Refrigerate until chilled and firm, about 2 hours. Using a sharp knife, cut into squares. If desired, drizzle with melted dark chocolate. Store in an airtight container in the refrigerator. Hello Rachel….! I love strawberry and I love chocolate with strawberry combo, this looks soooo good & delicious, sound soooo yummy, I will try to making this in this upcoming weekend. Thanks for sharing …..! I hope you love the fudge, Samantha! Thanks so much for your kind words. Hi! Would it be possible to make the fudge ahead and add the strawberries before serving? Thanks so much! Love your recipes! Hi Elizabeth! Yes definitely, if put the strawberries on top of cold fudge it won’t stay on though. It sounds weird but if you melt the top layer with a hairdryer (low heat, not too close) right before you put on the strawberries you’ll be able to press them in so they stay :) enjoy!!! These look lovely! Chocolate and strawberry are a great combo! So glad you like it and were able to salvage it by remelting :) enjoy, Ida! Yes the flavor will just be more pronounced! I made these yesterday & shared them with 3 other ppl who went crazy over them & couldn’t stop talking about them. I loved them too. They are rich – but perfectly rich in a really good way. I’m making another batch in a minute to take to dinner tonight. What a combination of delicousness!! And so easy & fast to put together, too. I will be making these many times over. Great job Rachel, thanks for sharing. So happy to hear you and your friends are loving them, Judy! Aren’t easy recipes the best?! :) Enjoy, and thanks so much for your feedback. I hope that you love it, Anna! I tried this recipe and my strawberries left this liquid film over the top layer and fell apart. How do I make my strawberries look fresh and beautiful like yours? Hi Heidi, sorry you had trouble! Did you use fresh strawberries? Frozen would result in a liquid film and be a lot softer, similar to what you mentioned. It’s important to have very fresh, perfectly ripe (not overripe) strawberries for this! It’s also best the first two days, after that the strawberries will soften. I have to comment again. I LOVED them as is but I wanted to try to make them Keto for me going forward – at least for as long as I’m on Keto. They turned out GREAT, so I wanted to share. Ist, I swapped out the maple syrup for 3 1/2 Tbls Swerve that I found at Mama Jeans. I didn’t ‘love’ the recipe like I wanted to due to the sugar alternative after taste (it’d be the same for me with Stevia or anything else as I am just getting used to the after taste). Anyway, I kept tinkering with my alterations bc I absolutely LOVED the original recipe so much (as did everyone I shared with), & I just wouldn’t be happy until my Keto ones tasted really awesome too. Raspberries are more Keto friendly than Strawberries and so for all you Keto folks out there, use the swerve, and then mash and fully combine 1/4 cup raspberries to the fudge mix , reserve 1/8 cup of it & pour the rest in a lined bread loaf pan. Doing so, by the way will change the consistency but trust the process, it’s fantastic. Top with upside-down raspberries in straight lines for a pretty presentation (& try to use similar sized ones). I have them touch side to side & top to bottom, then I drizzle the reserved chocolate diagonally. It helps to lift the fudge out of the pan 1st. I lift them back into the pan to freeze them & then try not to go crazy waiting for them to set up! Adding the mashed Raspberries to the fudge hides the funny after taste from the sugar substitute completely & being Keto, I eat these completely guilt-free. They are phenomenal! I make sure I never run out. Hope you enjoy! Thank you SO much for sharing your keto version here, Judy! I’m sure it will be well appreciated :) sounds so delicious with raspberries too! Enjoy! Sorry…forgot, the 1/4 cup ‘drizzle’ chocolate either has to be measured out before the raspberries are added or a different melted chocolate can be used, as the mix will thicken up when berries are added and will not be pourable. Yum! I surprised my hubby with three last night and he loved them! My girls went strawberry picking yesterday so this was a fun way to use some of them. I used coconut almond butter and it turned out great! I’ve been wanting to make one of your recipes for a while now and I just made these because I had some fresh strawberries from the market. Perfect chance to try a bakerita.com recipe hehe :) They turned out amazing!! I’m so happy I got around to trying your recipe! I didn’t have almond butter or maple syrup so I used peanut butter and agave syrup instead. But still very tasty. So thank you for creating this super delicious yet simple to make recipe! So thrilled you finally tried a recipe and that you’re loving the fudge, Kristie!! Thanks so much for sharing your feedback with me – I hope you love everything else you try as well! We have a tree nut and peanut allergy. Is there another oil you would recommend? Do you think soy butter would taste good in these? Hi Brandy, do you mean in place of the almond butter? You can use a seed butter, like sunflower seed butter, instead of the almond butter. I would definitely recommend that over soy butter. Hi Rachel! I am excited to try this recipe. Quick question! What do you use for chocolate drizzle? Did you just melt chocolate? Hi Emily, yup! I always use Santa Barbara Chocolate‘s coconut sugar sweetened dark chocolate. You can use the code BAKERITA for $10 off! I don’t have most of these ingredients on hand…But the fudge looks so tasty that I’m willing to search all the supermarkets in the country if I have to! Yum! Most of the products are available on Thrive Market too, if you want to order online! :) Hope you love them, Cindy. Can’t wait to try these for Valentines Day!